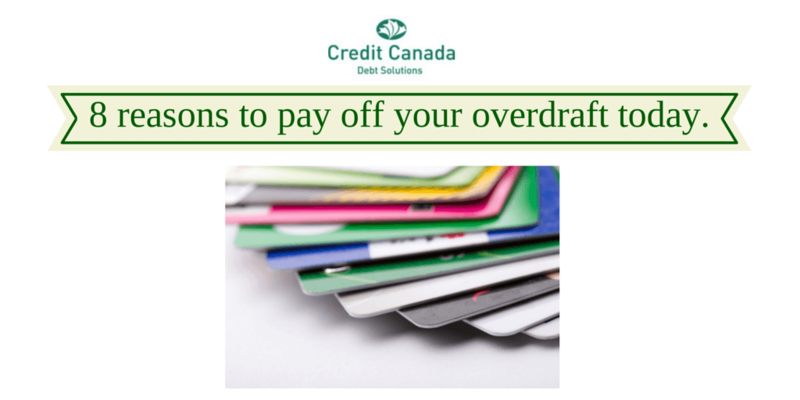 8 reasons to pay off your overdraft today. Paying off an overdraft---and staying above zero---is a very powerful step in debt management and relief from financial stress. 1. Find some solid ground on which to stand. If your account is overdrawn, how do you feel? Not so great. You can’t build a castle on shifting sand. When your foundation keeps moving south, your plan starts to flounder. A positive bank account balance will give you the strong baseline you need. 2. Immediate calm. When you have $3.00 in your bank account—you get that. What does it mean to have -$574.52? A negative balance makes you feel out of control, overwhelmed, and helpless. There’s a feeling of calm when you’re above zero, even by a few dollars. 3. More money in your pocket. No more overdraft interest or fees. This is very expensive borrowing. While you’re at it, try to keep a minimum balance in your bank account to avoid additional service fees or simply transfer to an institution that offers no-fee banking. 4. Forced budgeting and accountability. You start to pay better attention. You re-think and track every single purchase. Your spending patterns improve automatically as a part of a debt management program that works for you. 5. A built-in early warning system. As time passes, your positive balance becomes your new normal. If you become overdrawn again, you move quickly to fix it. This is Job #1 now. 6. Reality check 101. You uncover and resolve more serious financial issues. If you are unable to stay out of overdraft in spite of all of your efforts, there may be a problem. It could mean you need to earn more money…or you need some money management and budgeting tips…or maybe you need some debt repayment advice/assistance such as a custom debt management program from Credit Canada. 7. Your banker is a fair-weather friend, at best. Banks make a whole lot of money through overdraft interest and fees but they start to panic when you are ALWAYS in overdraft. If your credit score starts to drop as well, then you’re in trouble. Remember, your credit rating may be good but your credit score may be plummeting---they are two separate things. In some cases, your bank may “suggest” that you bring your bank account balance up above zero. But in some situations, they will simply cut you off without “asking” and revoke your overdraft privileges based solely on your poor credit score. Banks can do this. The overdraft privilege is set by the bank---and so, it’s probably best to stop depending on the overdraft while the choice is still yours to make. 8. And finally, the joy and bliss of PAYDAY! You can start looking forward to payday and planning your paycheque. It’s discouraging and disheartening to get to payday, only to find that you’re overdrawn soon after. Pay off that overdraft and your confidence will soar. In the past, you may have thought…who cares…what does it matter? It matters. You’ll feel empowered and realize that YOU CAN DO IT. And it may even help you find the strength to take on your bigger financial goals.